I have to admit I’m pretty excited about this post. Cloud seeding is my single favorite subject in all of meteorology. I love it because what it represents; that as we continue to better understand weather we will become more able to control. Now this may not mean weather-on-demand, but proactive measures to protect life and property. Cloud seeding is a form of weather modification, a man-made alteration to the climate system. But, unlike our current climate change dilemma, cloud seeding is intentional. Cloud seeding alters the moisture available in a cloud in an attempt to create additional rainfall. We do this by dispersing certain chemicals or salts into the cloud, affecting the physical processes occurring inside. These substances are delivered into the clouds by ground-based rockets or wing-mounted flares. 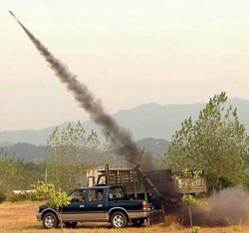 A cloud seeding rocket being fired from a pickup truck in China. Cloud seeding has a very interesting history. The idea can be traced back as far as the civil war. After battles involving large amounts of artillery fire, it is said that soldiers noticed a tendency for rain to fall. After the war, scientists began to ponder the possibility of manipulating the weather. It wasn’t until 1946 when a successful process was discovered. That was when Vincent Schaefer, breathing into a deep freeze chamber containing dry ice, Schaefer noted a bluish haze of millions of ice crystals. What was occurring here is that the moisture from Schaefer’s breath was condensing around the crystals of dry ice. You see a rain drop or snow flake can not just appear out of nowhere, they form around particles of dirt or dust or whatever is available. We call these particles cloud condensation nuclei, or CCN. Schaefer was using the dry ice as artificial nuclei in order to create new ice crystals (like what make up most clouds). That same year Bernard Vonnegut, brother of Kurt Vonnegut and colleague of Schaefer, discovered that the process could also be performed with silver iodide (AgI). 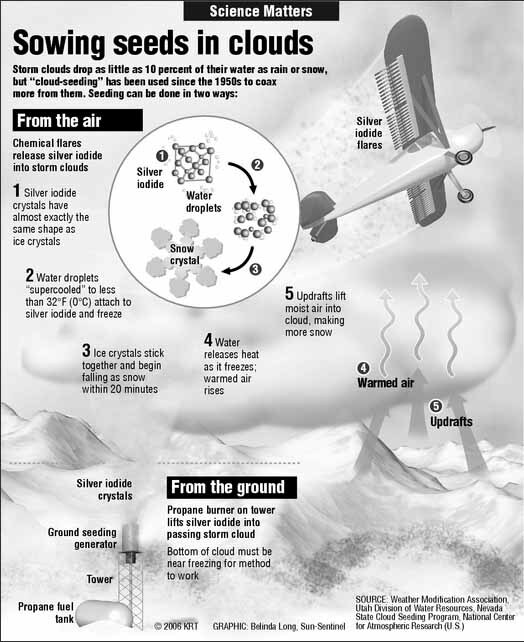 Silver iodide is the most common chemical used in cloud seeding in many regions. Since 1946 a constant stream of experimental programs from Mexico to South Africa to Australia has tried to prove that cloud seeding could be effectively used to generate more rain. The problem is we have no way of knowing how much rain would fall from a cloud if it wasn’t seeded, so skeptics will always overlook the results. Now that doesn’t mean they are wrong, many results are entirely inconclusive and their are some conditions where seeding just doesn’t. (You can’t get blood out of a stone, and you can’t get rain if there’s no moisture in the air.) But lately we have learned how to make seeding more effective and cost-efficient and I believe in the practice for regions where water shortages and droughts are putting millions of lives at risk. As climate changes worsens, the biggest threat will not be warming temperatures or rising oceans but devastating, extended droughts that empty underground aquifers and destroy crops. After the silver iodide or dry ice has been injected into a cloud, additional droplets form. This leads to more rain drops or snow flakes, which leads to increased levels of precipitation. The idea here is to more efficiently use the moisture available to the clouds. There is a lot of room for improvement here as the typical raincloud only transforms 20% of the available water vapor into rain. The name for this type of cloud seeding is static cloud seeding, but there are a few others. Dynamic cloud seeding is done very similarly to static, with the same chemicals and same tools. The difference is the amount of chemicals used; dynamic cloud seeding uses hundreds of times the amount of silver iodide or dry ice. What does this do? It has to do with latent heat. Think about melting ice; ice + heat = water. So the reverse is water = ice + heat. When cloud seeding turns the available liquid vapor into ice crystals, heat is released. Release enough of that heat and you can increase the strength of updrafts, or thermals. This allows the cloud to bring in more moisture than it would naturally. The last form of cloud seeding I’m going to mention today is called hygroscopic cloud seeding. Hygroscopic cloud seeding uses salts instead of silver iodide or dry ice and is the preferred form of cloud seeding in more tropical climates. Usually these salts are sodium, lithium, or potassium salts and they lead to larger drops than silver iodide. This leads to larger droplets falling faster and absorbing smaller ones until they are large enough to finally fall out of the cloud. This is called the collision-coalescence process. A different process is needed in the tropics because the air is too warm for ice crystals. The process was first theorized studying the resultant rain from the particulates released from a paper mill. What is it used for and where? Cloud seeding is used everywhere. China has the largest program, a program which I hope to devote an entire post to soon. The entire country is obsessed with it and farmers demand it from local governments. It is also used in North America, Europe, Asia, and Africa. Cloud seeding is used primarily for drought remediation. In areas where ground water is the primary source of fresh water cloud seeding can be used to replenish it. This is particularly important in the American southwest and Mexico. It can also be used to increase snow packs in areas where melting snow water is an important source of freshwater. Ski resorts can also benefit from cloud seeding services. A third use is hail suppression; seeding spreads the water vapor across an increased amount of smaller hailstones, increasing the chances that they melt before they hit the ground. Austria is a leading country in using cloud seeding in this way, protecting crops from destructive hailstones. It can also be used to rain pollutants out of the sky. In fact Russian pilots used cloud seeding to remove radioactive particles from the air after the Chernobyl disaster in order to protect Moscow. This will be the first of hopefully many posts on cloud seeding. There is a lot of conversation going on involving seeding that I want to cover and many of it is untrue. As an example, I’d like to introduce you to this video here that accuses the government of using cloud seeding to “steer” Hurricane Sandy. (Now I should admit the government has tried to alter hurricane before but it didn’t work, look up Project STORMFURY) Hopefully I’ll get to STORMFURY soon, but I will tend you know the idea of it was to weaken tge stprms. Also, and probably most importantly, cloud seeding has been proposed as a potential solution to climate change. The process, known as “cloud brightening” is interesting, relatively inexpensive, and will get it’s own post soon. 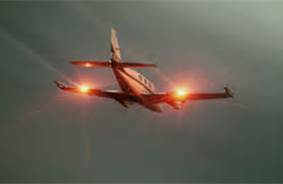 A plane with cloud seeding flares. The fact that cloud experimentation has been ongoing since the mid 40’s without any scientific consensus should speak to the complexity of the processes involved. The National Academy of Science declared that, as of 2003, cloud seeding study had not yet yielded convincing results. Cloud seeding is expensive and can be risky for governments to invest in. Even so, I myself do believe in cloud seeding and its potential to alleviate drought conditions and as a possible solution to climate change. Even though seeding is not 100% proven these issues are too important to let this potential solution sit on the sidelines. I know that as we go forward we can continue to make the science more effective and convince governments that cloud seeding is a viable option. I implore all of you to learn as much as you can about the science, not just the spin the different sides give it, and make you own decision. That’s all for now. Can’t wait for the next post!